What are the tuition and fees for the classes? Workshops schedules and fees may be found on the Workshops page and the 2014 Schedule. What programs are offered at CIJT? When are the next starting dates for a class? Class start dates are ongoing. 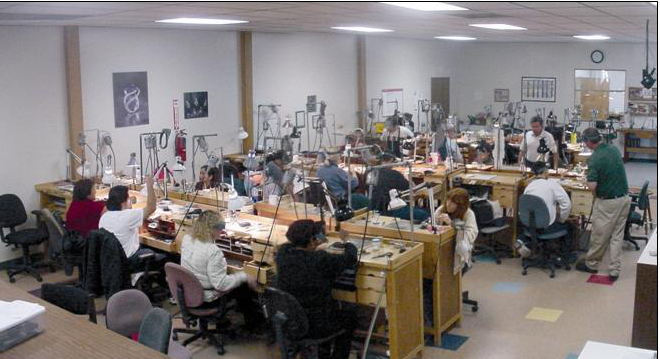 Jewelry Arts classes start on the first Monday of each month. Preliminary and Diploma gemology courses start 2 times per year. All start dates and workshop start dates are available when scheduled. MasterValuer™ Courses are ongoing open-enrollment which may start at the date of your choosing. 3-day workshops are scheduled in locations throughout the world. Dates are posted on the MasterValuer™ Website. Yes, there is a little more to tell about the classes but our brochures state much of the same information as on the website. We would prefer to talk to you personally about your goals and how CIJT can help you attain them with our classes, our methodology, and our strong educational programs. Please call and ask to speak with Mel or Dee. They will answer all of your questions or forward you to the person best suited to do so. The toll free number is 800-731-1122. You may also use our Information Request Form to submit your request online. When we receive this, we will respond to you promptly. How about housing and living accommodations? We assist in placing you in a comfortable living situation.. The cost of this is approximately $750.00 per month for a nice apartment. Housing is close to shopping malls and bus lines. The above costs are for rent only and do not include food or entertainment. I am an International student - what information is required? We are able to enroll international students who are in the US on a Tourist Visa. Call for information. I am a military veteran - do you take the GI Bill? We are very dedicated to our military veterans and support them in all ways we can. In fact, we have US Army veterans on our staff. Call for information. What Certificates or Diplomas are available through your programs? All gemological certificates and diplomas are awarded by the Canadian Gemmological Association upon a student's completion of the above required examinations (also given by the Canadian Gemmological Association).. The FCGmA credential, awarded by the Canadian Gemmological Association, is available from the association upon successful completion of all required examinations. This prestigious credential is known world wide. Be a certified Gemologist (i.e. GG, FCGmA, FGA, etc). Call us to discuss your credentials. Successful completion of resident MasterValuer Course (taught in multiple locations worldwide). Be a certified Gemologist (e.g. GG, FCGmA, FGA). Call us to discuss your credentials. See the MasterValuer website for further details. Do you assist with Employment Assistance? CIJT will assist all graduates with employment and placement upon successfully completing the course. We have no geographical boundary and have trained students from around the globe for over 3 decades. Please contact us for any further information needs you may have. You can download enrollment forms from our application page or use the links above. Please complete and submit with dates of class requested and a deposit for enrollment.